I recommend: getting a grip on the extent of the problem; funding to keep that picture up to date; and then funding fixes. Valdosta spilled not just twice, but two dozen times in December. Spills of raw sewage totaled more than six million gallons. Valdosta was not alone. Tifton, Quitman, and Lowndes County also spilled. After a campaign by Suwannee Riverkeeper’s umbrella organization, WWALS Watershed Coalition (WWALS), involving thirty Florida and Georgia organizations, the Georgia Environmental Protection Division (GA-EPD) publishes statewide spill reports each business day. While Valdosta’s weekly river water quality testing shows bacterial contamination even when there are no spills, Valdosta is reducing its testing from weekly to monthly. WWALS has started a 3-point water quality monitoring program to analyze how far down river spills affect the rivers; when the rivers are affected without spills; and what are the other sources of river contamination. The state of Florida is doing a surprising amount of testing, especially at springs. However, there are gaps from the state line downstream. Florida should fund and direct the Florida Department of Environmental Protection (FDEP) to fill those gaps. The Georgia legislature should fund and direct GA-EPD to test regularly upstream and downstream of Valdosta, Tifton, and Quitman. Since Valdosta is by far the biggest source of sewage spills, GA-EPD Should direct Valdosta to do further testing (or to fund it) as part of the consent decree GA-EPD already has with Valdosta. In December, the Valdosta City Council authorized another half million dollars in sewer system improvements including a Supervisory Control and Data Acquisition (SCADA) system for fast internal notification. That would have been useful last January, when a spill that could have been stopped ran for hours. The December 2018 rains that overflowed Valdosta, Quitman, and Lowndes County were not even double the average monthly summer rains. Should we expect more spills this summer? We need risk management. All Suwannee River Basin cities need to plan for peak projected rain, not just average. We are appreciative of the $60 million Valdosta has already spent on sewer system improvements, with more to be spent. Valdosta is also planning a bigger catch basin to prevent overflows at its Withlacoochee Wastewater Treatment Plant, which spilled 4 million gallons at that location alone in December." However, as the biggest city in the Suwannee River Basin, Valdosta has a responsibility to finish the job. Most of Columbia County is not downstream from Valdosta, but the stigma and the economic effects of people being put off fishing and boating affect Columbia County. Florida and Georgia legislators should help by allocating funds. In Florida, water quality testing funds are the most obvious. In Georgia, testing and more sewer system improvement money would help. Threats of lawsuits have gotten attention to the problem and may yet result in lawsuits. Regardless, testing and funding will still be needed. Let’s start with testing and funding now: everybody benefits. 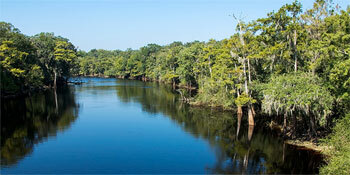 John S. Quarterman is the Suwannee Riverkeeper, with WWALS Watershed Coalition. He is a Georgia native, Harvard alumnus, and one of the first to recognize that the internet was going to be big.